1. 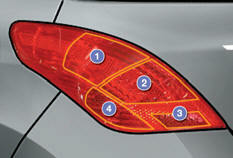 Brake lamps / sidelamps (P21/5W). 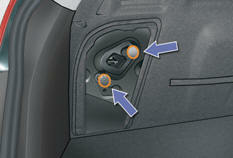 If the vehicle is fitted with the JBL audio system, on the right-hand side, first remove the three fixing bolts, then move the box. 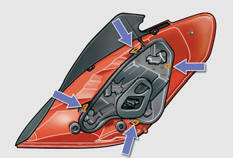 press the four tabs and remove the bulb holder, turn the bulb a quarter of a turn and change it. 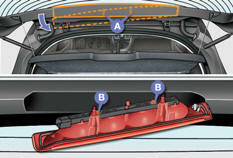 Unclip the tailgate upper trim from left to right. Unscrew the two lamp fixing nuts A .
Unclip the lamp's central pin. Extract the lamp from the outside. Disconnect the bulb holder connector and the wash-wipe pipe. 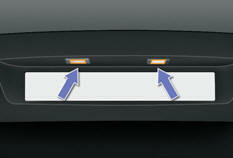 Unclip the bulb holder from the lamp by pressing on the two tabs B . Do not apply force to the lamp when tightening the nuts.